Green energy is the general term we use to define energy that utilizes renewable resources which do not damage or effect environmental sustainability. Finding and harnessing these green energy sources has only been possible over these last few decades due to major advances in technology and the growth of the energy sector. One possible source for this future renewable energy is marine power, known affectionately as Blue Energy. Marine power, or blue energy, is the ability for technology to utilize the movement of the ocean waters. If you have ever lived near the ocean, you know all about tides. Like clockwork, everyday the tide rolls in and out moving massive amounts of water around the oceans, from here to there and back again. Luckily for us, this massive movement of water also happens to contain a huge amounts of kinetic and potential energy. One of the best features of “renewable tidal energy” is the fact that it is highly reliable since we can predict it over many months if not years. If the power of the oceans tides could be converted into usable energy, it may be one of the answer to many of the energy problems in the world. Tidal energy is based on the movement of the tides. Tidal turbines are placed under the water and as the tidal water moves so to do the turbines. Tidal movements have a force that can rotate the turbines at a constant rate, that the turbines can convert the waters kinetic energy into usable electricity. Electrical power is harvested from the oceans tides in a similar fashion to hydroelectric energy recovery. Tidal barrages use the same damming principals found in hydro power and hydroelectric power production for the generation of electricity. It uses large low-head turbines which can operate for a greater fraction of the day. As the ocean tides come in, the sea water level is raised in an enclosed water basin or estuary trapping it behind a dam like wall. At low tide when the tide recedes, this trapped water is let out and diverted through flood gates and pipes were underwater turbines spin and electric power is created similar to hydroelectric power. The disadvantage of tidal barrages is that it is a slow generation process because it takes 12 hours for the tide to move from low to high. Then another six hours for the tide to retreat back to low again. Also building dams and barrages across tidal estuaries is an expensive process, therefore the best tidal sites are those that exist where a tidal bay has a narrower opening, thus reducing the length of the dam required. Tidal stream power is another form of tidal energy but is different in that it captures the energy produced by the oceans tidal flow without the need for dams and tidal barrages. 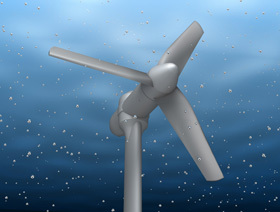 Tidal stream power is usually accomplished through the use of an underwater turbine similar in function that looks like a small-scale wind turbine. The horizontal movement of the tidal water is converted into electricity. While this may seem the obvious way to go after tidal power, there are some inherent problems. First, tidal water moves much slower so the underwater turbine rotates at a slower speed. Second, the energy in tides is spread across greater areas, unlike tidal barrages which concentrate the moving water through flood gates and pipes, so the energy in the amount of water that would pass a large underwater turbine is relatively small resulting in turbines with much larger turbine blades. The fact that ocean tidal energy is 100% eco-friendly without any greenhouse gas emissions or noise and low carbon footprint, the future is bright for this renewable energy source. There are many advantages of tidal energy compared to other forms of renewable energy with its main advantage being that it is highly predictable from both size and time aspects, which means power generation is predictable too, unlike wind or solar energy. In fact, you can go to any surf or sailing store and pick up a tidal timetable. However, like many other forms of renewable energy, tidal energy also has its disadvantages such as its inflexible generation times dependent upon the tides and the fact that it operates in the hostile salt water conditions of the open oceans and seas which can be a stormy and violent environment, resulting in the tidal turbines being destroyed by the very energy they were designed to capture. Also the cost of plant production and the time needed to establish a fully working tidal generation plant, any large scale commercialization of this renewable tidal energy would require extensive upfront capital. It takes approximately 10 years to build a new plant with the return on that investment taking another decade or more to realize. This means a minimum investment of twenty years needs to be assumed before investors see any profit from the tidal wave energy. To learn more about “Tidal Energy”, or to explore the advantages and disadvantages of how Tidal Energy is being used as an alternative energy resource, then Click Here to order your copy from Amazon today and find out more about blue energy, tidal energy, and the energy revolution from the sea. Tidal power traditionally involves erecting a dam across the opening to a tidal basin. The dam includes a sluice that is opened to allow the tide to flow into the basin; the sluice is then closed, and as the sea level drops, traditional hydro power technologies can be used to generate electricity from the elevated water in the basin. Some researchers are also trying to extract energy directly from tidal flow streams. The energy potential of tidal basins is large — the largest facility, the La Rance station in France, generates 240 megawatts of power. Currently, France is the only country that successfully uses this power source. French engineers have noted that if the use of tidal power on a global level was brought to high enough levels, the Earth would slow its rotation by 24 hours every 2,000 years. Tidal energy systems can have environmental impacts on tidal basins because of reduced tidal flow and silt buildup. Kinetic energy (movement) exists in the moving waves of the ocean. That energy can be used to power a turbine. In this simple example, (illustrated to the right) the wave rises into a chamber. The rising water forces the air out of the chamber. The moving air spins a turbine which can turn a generator. When the wave goes down, air flows through the turbine and back into the chamber through doors that are normally closed. This is only one type of wave-energy system. Others actually use the up and down motion of the wave to power a piston that moves up and down inside a cylinder. That piston can also turn a generator. Most wave-energy systems are very small. But, they can be used to power a warning buoy or a small light house. Another form of ocean energy is called tidal energy. When tides comes into the shore, they can be trapped in reservoirs behind dams. Then when the tide drops, the water behind the dam can be let out just like in a regular hydroelectric power plant. In order for this to work well, you need large increases in tides. An increase of at least 16 feet between low tide to high tide is needed. There are only a few places where this tide change occurs around the earth. Some power plants are already operating using this idea. One plant in France makes enough energy from tides to power 240,000 homes. The final ocean energy idea uses temperature differences in the ocean. If you ever went swimming in the ocean and dove deep below the surface, you would have noticed that the water gets colder the deeper you go. It’s warmer on the surface because sunlight warms the water. But below the surface, the ocean gets very cold. That’s why scuba divers wear wet suits when they dive down deep. Their wet suits trapped their body heat to keep them warm. Power plants can be built that use this difference in temperature to make energy. A difference of at least 38 degrees Fahrenheit is needed between the warmer surface water and the colder deep ocean water. Using this type of energy source is called Ocean Thermal Energy Conversion or OTEC. It is being used in both Japan and in Hawaii in some demonstration projects. 1) What kinds of technology is there to produce tidal energy and how do they work? 2) Where around the world are there tidal energy plants located and where else can they be placed? 3) How much power can we harness from tidal or wave energy? 4) How far has tidal and wave energy advanced? 5) How environmentally safe is tidal and wave energy? 6) Is wave energy a good option for our country as an alternative fuel?